Haircut by David Alexander | Photo © David Alexander. The classic High and Tight haircut, commonly worn by United States Marines and Army Rangers, is a favorite military style haircut. While the cut may be a bit extreme for many civilians, for those looking for a highly masculine, low-maintenance haircut, the high and tight is a great option. The high refers to the longer hair on top above the temples, while the tight refers to the hair that is closely shaved below. It also has a bit more character than the popular buzzcut style haircut. While this haircut is often worn by soldiers in many branches of the military, where regulations permit, it is the common haircut worn by many in the United States Marine Corps (although it is not required), who are often called "jarheads" because the style resembles a mason jar. This hairstyle works perfectly for those who frequently have to wear helmets or other forms of headwear. This photo is what I consider the classic high and tight. For this style, the sides and back are shaved all the way up to just past the round of the head (the sides are wet shaved with a straight razor). Because of the shape of his face, the top was cut free-hand clipper-over-comb to allow me to achieve a slightly flat shape on top. While some in the civilian world may choose to wear this style with a visible line of demarcation between the shaved sides and the top, any visible line would certainly be out of regulation for most men in the armed services. For an example of how the high and tight is properly blended, see the side view of this haircut on the next panel. 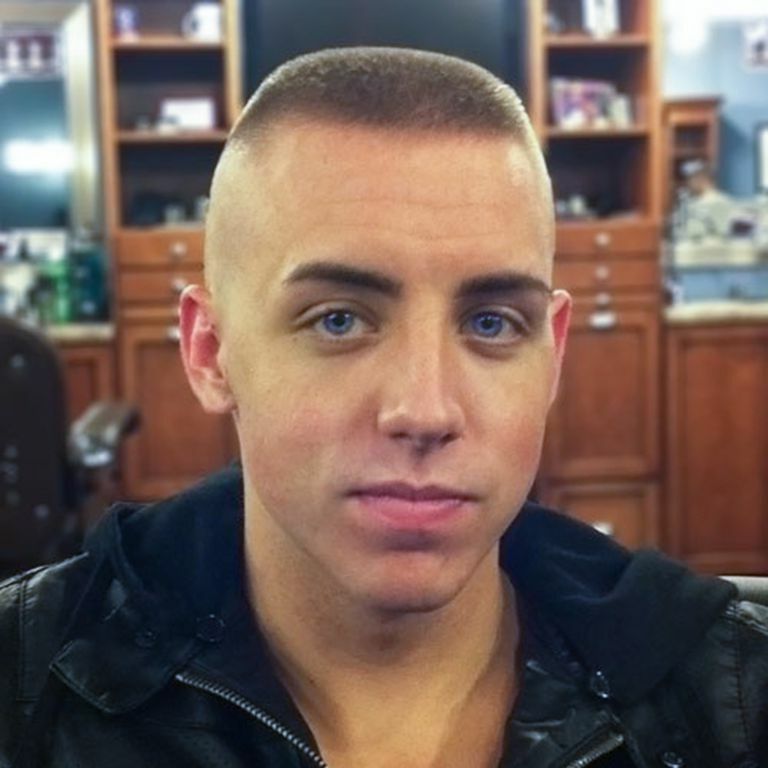 The side view of this high and tight haircut shows proper blending as well as how the style should conform to the shape of the head at the crown. This style is a really great option, not only for those in the military but for athletes or others who desire a cool low-care hairstyle. One of the great things about the high and tight haircut is that no styling is required (yet, because of the contrast between he shaved sides and slightly longer top, the style still has some character (and requires a skilled barber to perform successfully). This ultra-short high and tight is very low-maintenance, but for those who choose this style, we highly recommend the application of sunscreen to prevent scalp sunburn. Haircut by David Alexander | © David Alexander. For this variation of the high and tight haircut, the hair was cut to the skin just past the round of the head (finished with a straight razor shave). For the top, we used a number two blade all over and evenly blended the top into the shaved sides. This next variation of the high and tight haircut (more of a high fade or aggressive Ivy League) leaves a tad more length on top and is not straight razor shaved on the sides. The hair is clipped short over the crown to conform to the shape of the head, while gradually getting slightly longer towards the front. This style, while certainly well within most military regulation is less extreme and may be more suited for the civilian male. While this variation of the high and tight may certainly be worn without styling product, a small amount of pomade or styling wax can give a slightly more polished look.